I don't know if this is a soup/cereal bowl, or the smallest size of a nesting mixing bowl set. It holds approximately 14 ounces and measures 5 inches across the top and 2 1/2 inches in height. The bottom is marked with the F in a shield Heat Proof USA. There are no chips, cracks, breaks or rough areas. There are little to no usage marks. 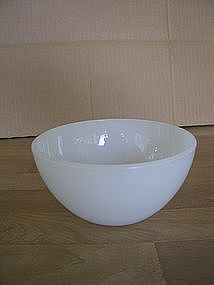 It does have some of the normal manufacturing lines common in milk glass of the era. There are 3 bowls available and priced individually. I need your zip code to calculate the postage.